Packed with culture and adventure, while tapping into Mayan influences and environmental ethos, Cancun feels like an exotic getaway, but is just a quick flight from most U.S. cities. The Caribbean Sea’s aquamarine hues and the region’s balmy year-round temperatures have enticed dozens of all-inclusive resorts to fan out their pampering amenities along the shoreline. Whether you are happiest chilling on the beach (fruity drink in hand, of course) or snorkeling in the wide-open sea, there are plenty of angles to explore Riviera Maya’s largest city. Here are the best things to do in Cancun. Cancun beaches, beautiful as they are, can get crowded with tourists. Stray from the pack and head to Playa Delfines, a public beach where locals like to unwind. While there might not be roving waiters with trays of margaritas, palapas are available and drinks can be brought in. Coba, Chichen Itza and Tulum are all doable for a day trip, but still quite a trek. El Rey, named for a skeleton unearthed at the site, is right in Cancun’s Hotel Zone —and not everyone knows about it. The region’s rich Mayan heritage comes alive through 47 stone sculptures dating back to 1250 A.D.
Out of all the things to do in Cancun, this one is a must. The best way to see MUSA, an underwater sculpture garden of 470 statues, is from just below the water’s surface. Book a snorkeling excursion with Aqua World which includes fins, masks and vests, plus drinks and tunes onboard. You’ll also spot colorful exotic fish. 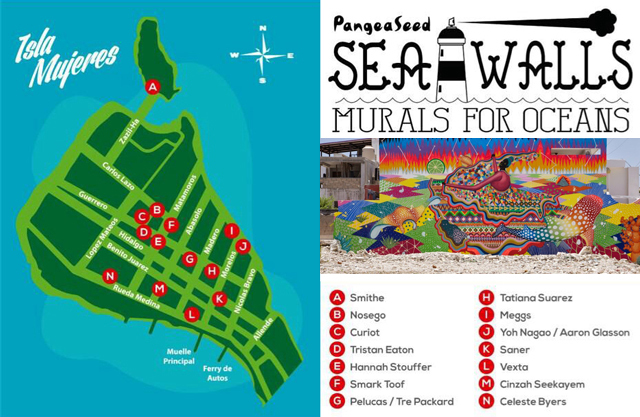 Artists from around the globe are transforming Cancun’s urban walls and abandoned residential areas into murals bursting with color and ocean-conservation themes. The first of these murals (on four buildings) were unveiled in late February, a partnership among three government agencies. The next collection, spanning eight buildings, debuts in early July. Departing from downtown Cancun, the nightly 2½-hour Taco Tour fills your belly with grub at four stops, led by locals who know the food scene in and out. Sure, Cancun resorts are flush with fine-dining options but street-food fare is equally trending, and off the beaten path. Sidestep the luxury, designer-label shopping malls for artisan-made crafts, fashion accessories and home decor Mercado 28, a market in downtown Cancun with 100 shops. From embroidered pillow covers to hand-painted pottery, check off the items on your souvenir and gifts list and have pesos left over to splurge on a beautiful scarf just for you. Mexico boasts nearly 7,000 naturally occurring cenotes, swimming holes formed when limestone rock collapses, and most are found on the Yucatán Peninsula. The Ik Kil cenote is a two-hour drive from Cancun, and worth the drive: explore gorgeous caves and jungle foliage, and cool off with a dip in the chilly water. Bonus: the cenote is near Chichen Itza’s Mayan ruins. To see both in one day, book a tour with Entertainment Plus. Just a quick 15-minute ferry ride from bustling Cancun is Isla Mujeres, a laid-back island practically free of cars — everyone cruises around in a golf cart. Ferries depart from Gran Puerto and Terminal Martima Puerto Juarez, 10 minutes north of Cancun by taxi, every half hour between 5 a.m. and 9 p.m. Consider activities like kayaking at Garrafón Reef Park or exploring the sea-wall murals. Part of the Experiencias Xcaret family of eco-oriented parks (its siblings are Xcaret and Xel-Ha) Xenses opened last June in Playa del Carmen, an hour’s drive south of Cancun. Built around 15 sensory experiences on land and in water — such as bathing in mineral-rich mud, walking in a dark faux jungle and zip-lining in a bird costume — this family-friendly park takes about a half day to explore.